When I think about how I learn about new books, podcasts, and things that will improve my life, it's almost always personal recommendations that I trust the most. Paid advertising is here to stay--but personal referrals are what I trust as a consumer and what I strive for as a business owner. I gather recommendations for my own life from my Facebook and Instagram feeds, but more commonly, through Instagram stories (there's something about that extra bit of explanation, right?). I've been a longtime reader of several blogs that feature 'Favorite Things' lists and wanted to start a new series in the same spirit. 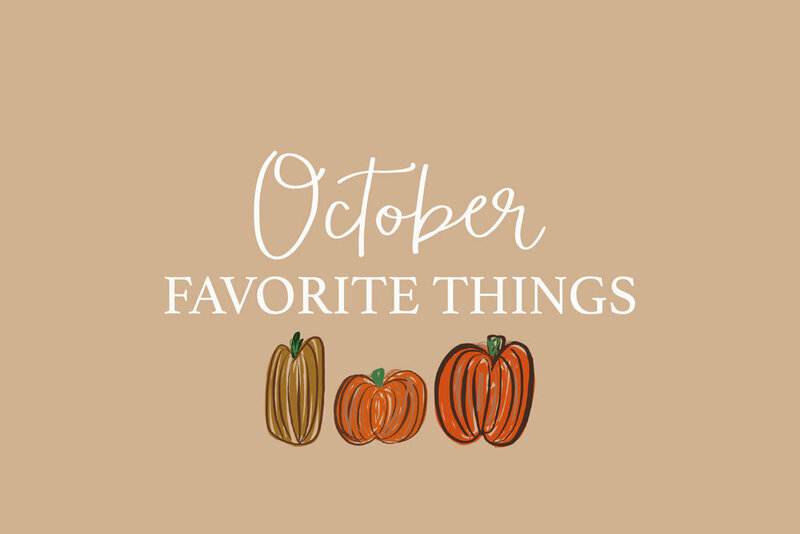 Stay tuned for November's list, as I'll be putting together a Favorite Things giveaway purely to bless some people. As a child of the 90s, who would I be if I wasn't forever impacted by the annual Oprah's Favorite Things giveaway? Questions? Thoughts? Let me know in the comments! If you have been watching my Instagram stories, you have probably seen me share about my Fitbit at some point. Though I have friends and family members who have had Fitbits for years, I didn't think much about counting steps until I saw a plant-based Instagrammer post a screenshot of her daily Fitbit stats from the app. As a former charter school teacher, I am VERY motivated by data--not a ton of intrinsic motivation, apparently. I started to track steps with my iPhone and was dismayed to find that some days, I was logging only 1,000-2,000 steps. (For those of you who don't know, 10k is the recommended step count per day--and is equivalent to about 5 miles.) The iPhone step counter is quite inaccurate for obvious reasons--you must have the phone on your person at all times. However, for as flawed as it was, it got me into the habit of being mindful of my 10,000 step goal for a few weeks. It buzzes every hour to remind you to get your minimum 250 steps. It buzzes and celebrates with confetti when you meet your daily goal. There are different settings for different types of exercise, but I most often use the 'Run' setting on the watch, which allows me to see my steps, pace, mileage, calories burned, etc. while I'm running. The app's data reports are super helpful. Categories glow in green and explode with confetti when daily goals are met in certain areas. Every week, I get an email recap that shows how my activity has gone up or down from the previous week. I don't always sleep with it, but the FitBit measures sleep, including the four stages of sleep. I was surprised to learn that I wasn't getting as much sleep as I thought I was. The cardio feature is super eye-opening. The watch tells you which cardio stage you're in while you're exercising--fat burn for lower impact (fast walking, for example), cardio for medium (for me, jogging), and "peak" for your peak heart rate (running fast for longer periods). I was surprised to learn that even when I was out jogging for 25 minutes, I sometimes didn't make it to the peak heart rate zone. In fact, I only really make it into the peak zone if I'm at a group cardio class in the gym or if I run 3 miles or more at a time. That told me that I needed to work harder as I was working out (breaking more of a sweat, becoming breathless) in order to really impact my heart health--and I need to stick with the exercise for 30+ minutes to an hour. The app also gave me a rating on my heart health is in general. I fell into the 'good' category--which made me want to work harder to reach the 'very good' and 'excellent' zones. Since I've had my FitBit, I've gone from working out 1-2 times a week to getting my 5-6 days of activity goal met every week. While you can't respond to texts as with an iPhone, the Charge 2 will allow you to read text notifications. I find that I'm on my phone less while I'm working. To summarize, I am NOT a proponent of gadgets for the sake of gadgets. However, I have noticed a huge difference in my activity since using the FitBit--and it's not just about number of steps--I'm pushing myself more because of the heart rate monitor. Highly recommend! As a former English teacher, I'm a big reader, and I always have been. I was raised by a mom who is an expert reader and routinely finishes a book in a day. Though I love to read and I read quickly, I rarely finish a book in a day. However, I read Where They Found Her by Kimberly McCreight on the way back from Disneyland and finished it in one day. If you are a fan of true crime podcasts, you will like this book about the impact of a crime on a small university town. The book is presented from the perspective of several different townspeople and covers a range of ages, socioeconomic statuses, etc. I couldn't put it down and loved it. I share my New Morning Mercies devotional passages on my Instagram stories occasionally, and I immediately get questions and responses from handfuls of women. Paul David Tripp's writing is SO GOOD, friends. I recently tried to remember how I stumbled across it, and couldn't, but I've used it for at least a year. I tried to explain it to one of the women in my morning small group, and all I could think to say to describe the tone was: "It's no Jesus Calling." If you've used Jesus Calling, you'll know that JC is more of a warm, sweet, loving tone. Paul David Tripp's writing is extremely encouraging, but it's also BOLD and hard-hitting sometimes, in a good way. His daily devotionals have the power to change the way I'm thinking on a given day; they are such a refreshing look at the Gospel. Highly recommend it! While I'm not a mom myself, I love the God Centered Mom podcast because host Heather MacFadyen does a wonderful job sourcing interview subjects and soliciting wonderful content. In fact, I find that some of the episodes have less to do with child rearing and a lot to do with topics that apply to everyone, so I love that it is inclusive in that way. I'm a regular listener of the NY Times Daily podcast, which covers daily news and current events in about 20 minutes a day. I find the reporting to be very thoughtful and love that the voices on the podcast are the same people who report the print news. The NY Times has a newer podcast called The New Washington, which features interviews with key players in the current political landscape in DC. One of the interview subjects mentioned that political figures generally aren't fond of speaking to reporters for the print press, as their words get sliced up and used in whatever context fits a reporter's article. Podcasts, however, offer an opportunity for leaders to speak candidly at length. The result is pretty fascinating! If you are interested in politics, I highly recommend the New Washington, which comes out every Saturday. My favorite episodes so far feature interviews with Nancy Pelosi, Sarah Huckabee Sanders, & Roger Stone. There we have it! My recommendations for October. If you have recommendations for me, leave them in the comments below. I'd love to hear from you!